News editor Erica Teichert and reporter Elizabeth Whitman show off the Neal Awards. 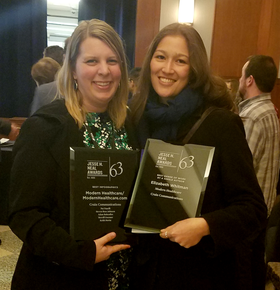 Modern Healthcare is honored to announce its staff won two Neal Awards on Friday, the 63rd year of the prestigious business-to-business editorial awards. Our victors include Pat Fanelli, Merrill Goozner, Keith Horist, Steven Ross Johnson and Adam Rubenfire for Best Infographics for our Data Points feature, and Elizabeth Whitman for Best Range of Work by a Single Author. See the winning works below.